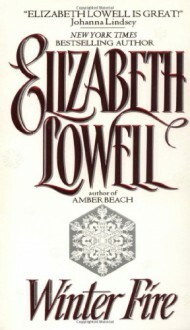 Orphaned at thirteen, a mail-order bride at fourteen, widowed at sixteen, Sarah Kennedy has learned to depend upon no one but herself--reserving all her love for her younger brother Conner, and for the wounded hawks she heals and returns to the air.A hardened Civil War veteran, personal tragedy has taught Case Maxwell three things: to be a patient, deadly fighter, to love nothing that can die; and that justice is blind. But when a confrontation with his sworn enemies, the Culpepper clan, leaves him near death, Case finds himself, like many another damaged wild creature, under the tender, unwanted care of Sarah Kennedy.Destiny has brought the healer and the warrior together to brave chilling risks and dangerous truths in a hard, magnificent land--two souls haunted by a perilous present and the bitter ghosts of the past. But the intense emotion both Case and Sarah fear--the passion that burns like fire in the very heart of winter--is the only thing that can truly save them, as together they seek the courage to face the greatest risk of all: love.Orphaned at thirteen, a mail-order bride at fourteen, widowed at sixteen, Sarah Kennedy has learned to depend upon no one but herself--reserving all her love for her younger brother Conner, and for the wounded hawks she heals and returns to the air.A hardened Civil War veteran, personal tragedy has taught Case Maxwell three things: to be a patient, deadly fighter, to love nothing that can die; and that justice is blind. But when a confrontation with his sworn enemies, the Culpepper clan, leaves him near death, Case finds himself, like many another damaged wild creature, under the tender, unwanted care of Sarah Kennedy.Destiny has brought the healer and the warrior together to brave chilling risks and dangerous truths in a hard, magnificent land--two souls haunted by a perilous present and the bitter ghosts of the past. But the intense emotion both Case and Sarah fear--the passion that burns like fire in the very heart of winter--is the only thing that can truly save them, as together they seek the courage to face the greatest risk of all: love.